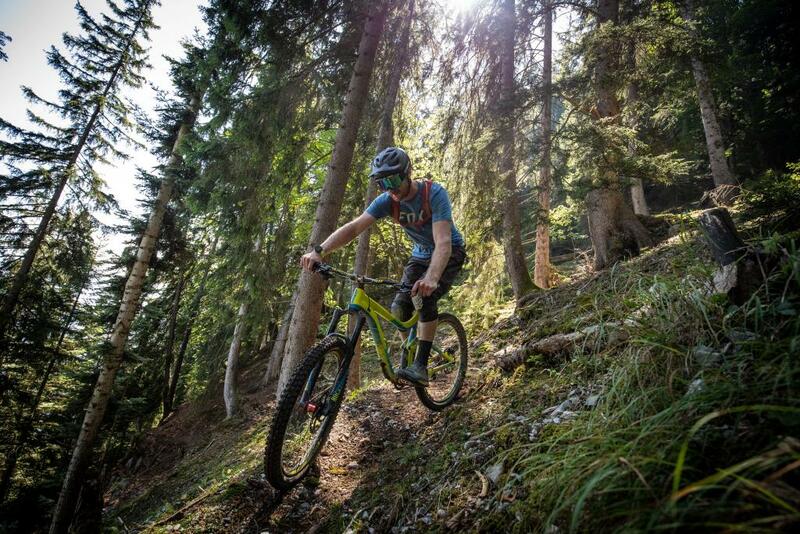 There are official trails and not so official trails in the Portes du Soleil once you venture beyond the lift system. Singletracks that have popped up over the years that are becoming well established and recognised, some you'll find on a map, others, well, you'll need to speak to someone in the know to discover! 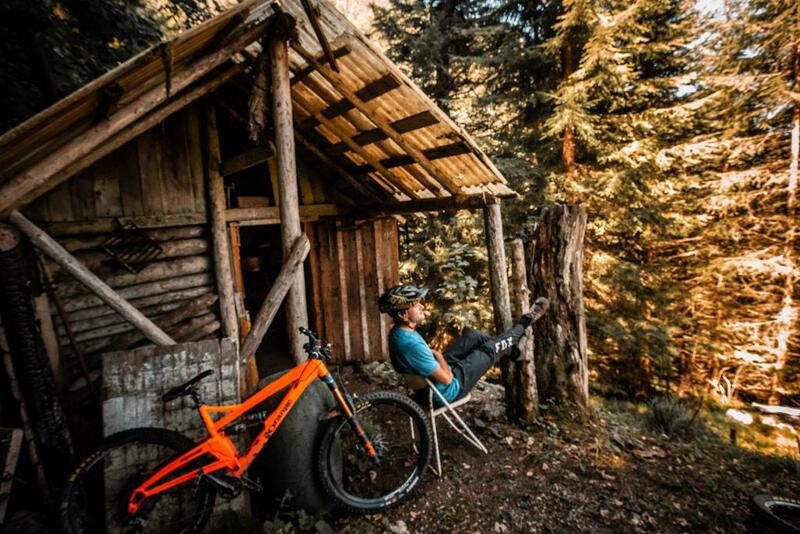 One thing is certain, with the development and rise in popularity of the enduro 'do it all bike', there is a growing desire for adventure. Maybe you don't ride 15 laps in a day, maybe just one is enough. It's these days that tend to live in the memory and it's these days that keep you asking what's next? It's these days that bring you back and keep you searching for more. Monthey is a town in the Swiss Valais. Driving there from Morzine would take you around one and half hours. It's nestled at the very bottom of the valley road that you'd take if you were driving to Champery. 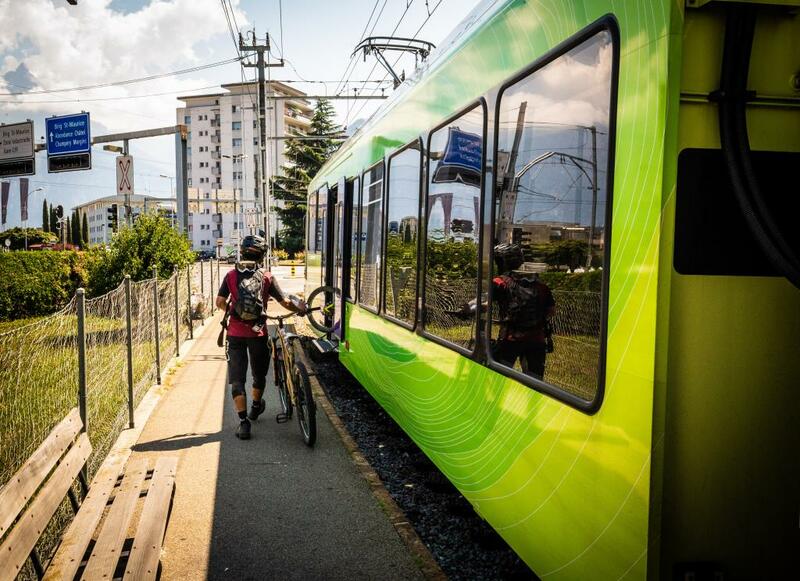 It's an industrial town without too many interesting things to note, other that a mountainside over looking it that boasts some excellent singletrack! Now, to the High Vi vest health and safety. We are not going to tell you how to get here. You're a long way from Morzine, the route is complex and a helluva lot can go wrong in finding, riding and getting home from the trail. 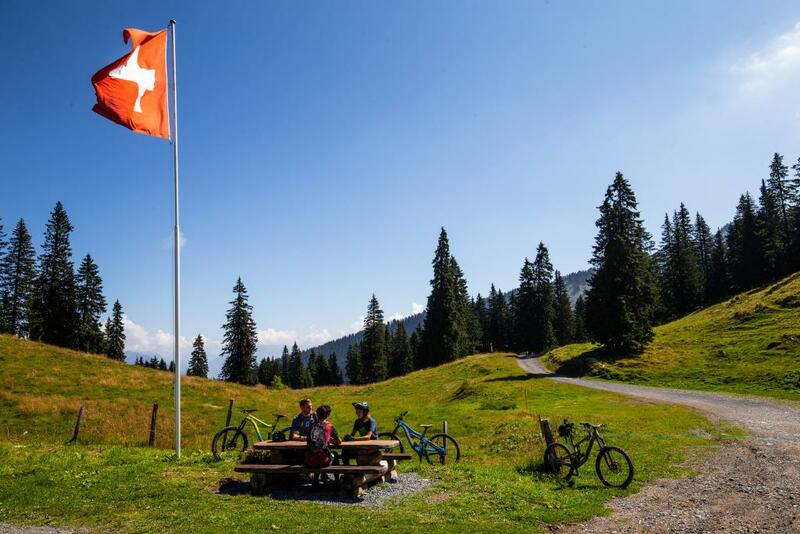 If you want to ride this and many of the other back country adventures surrounding Morzine, we highly suggest you take a fully registered guide. Try our friends at MCF or Rideability. 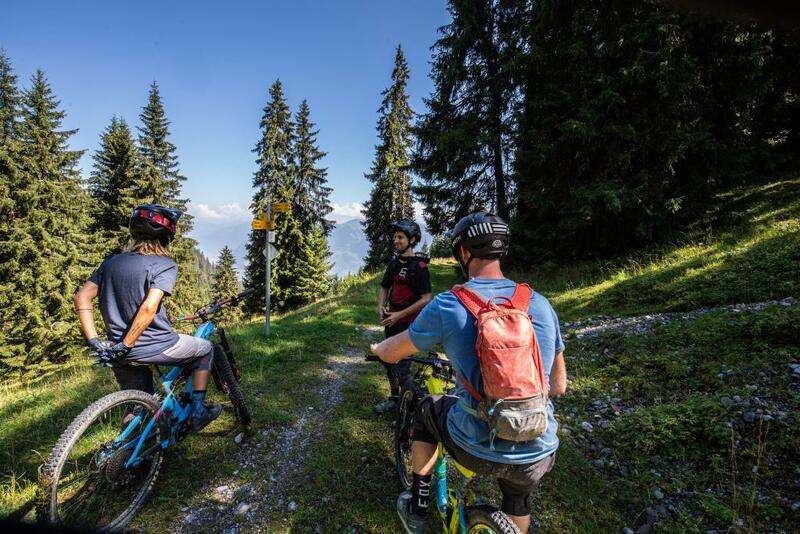 Suffice to say, this is full day out, you'll want to be taking first lifts from Super Morzine, heading over towards Chatel, riding into the town itself and taking lifts until you end up in the middle of the Swiss Portes du Soleil ski fields. 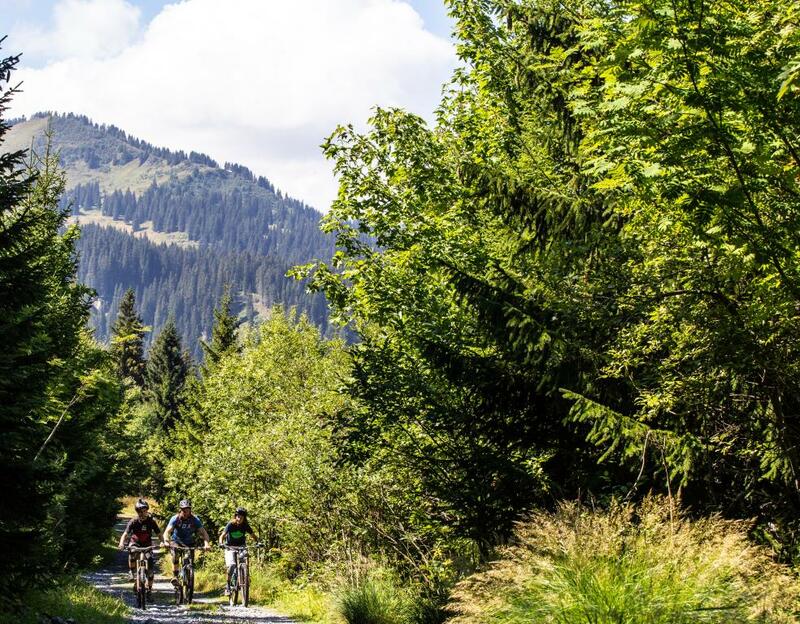 You'll be pedalling quite a bit, hopping some fences and racing along a main road to catch a train back up to Champery and finding your way home from there to Morzine. The trail starts in the open forest, about 300m or windy singletrack littered with rocks, due to the hills aspect, it's often a touch greasy here, so be wary! 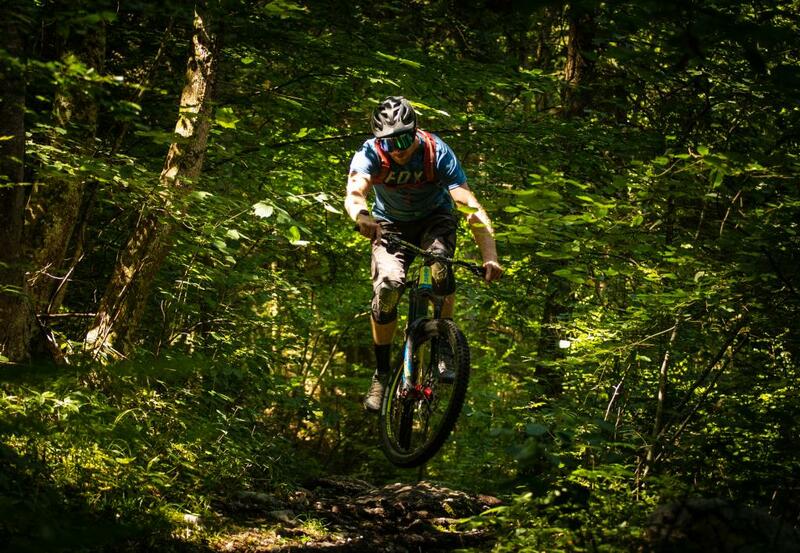 It the dives into the woods for some super technical switchbacks. These switchbacks make up most of the upper quarter of the trail. Hilarity ensues, there's not much Strava gold to be had here, relax and laugh at your buddies rolling around the hillside trying to to navigate 180 degree hairpins! Either you can ride steep switchbacks or you can't. 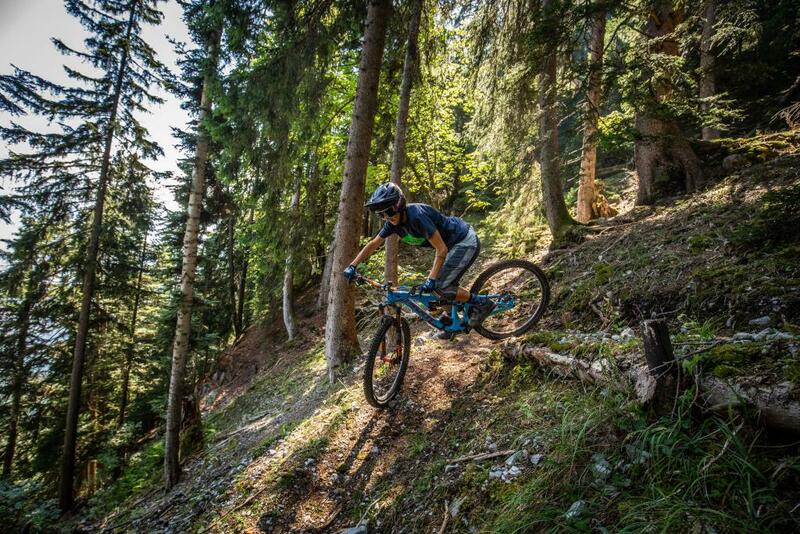 By the end of the first few kilometeres or trail you'll certainly have had enough practice. The terrain here ranges from clay mud to soft loam. It's steep, rooty and rocky. 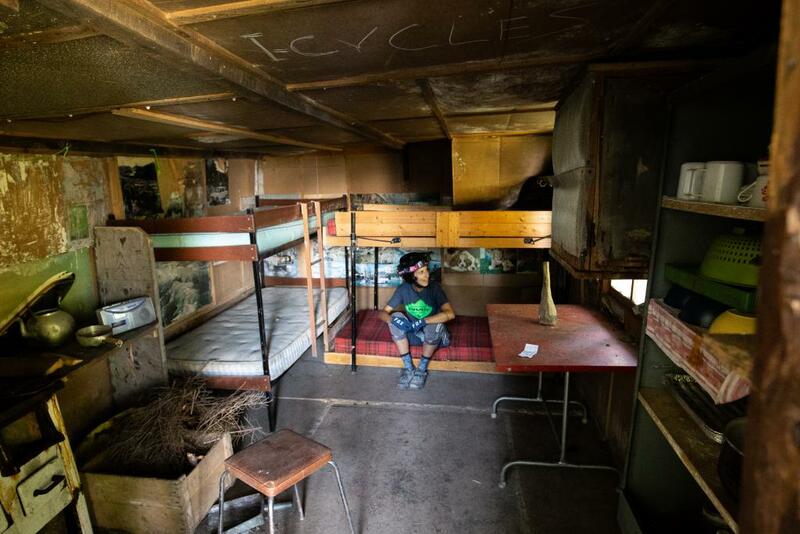 *There is absolutely a hole in the roof, the bunk beds will collapse if slept on, the stove has a family of badgers living in it, there are no batteries for the cassette player and the pots and kitchen equipment will absolutely carry at least some E-Coli. After you've sampled the good life living off the land in the country, there's some more adventuring to get on with. If you're not the best with exposure this maybe where you'll want to step off (or not)! The trail opens up for around 200m before crossing some avalanche scree slopes and roped in cliff traverses. The loose rock here makes the slopes quite treacherous as your feet sink in and search for grip. It's a long old slide down the the valley floor so it's not a time to play around, too much! By now your either having the best adventure day ever, having a nightmare from crashing and mechanicals, or somewhere in between. Once you've navigated the switchbacks, cliff faces and scree slopes the run down to the valley floor becomes all about flow. It remains technical, with high consequence steep corners, rocks to catch you and your pedals out and sections littered with ancient roots. But now you can open the throttle, it's a good 20 minute descent to the valley floor! Keep your wits about you as some of the turns can come real fast! The terrain ranges from steep to flat, some long straights and wide drifty corners. The trail is shared with walkers, so make sure the responsible person, as in the guide is out in front keeping everyone in check! There is one particular right hand corner near the finish which needs special attention, over shoot this one you're going to end up like Wiley Coyote plastered onto the side of the opposing gully! 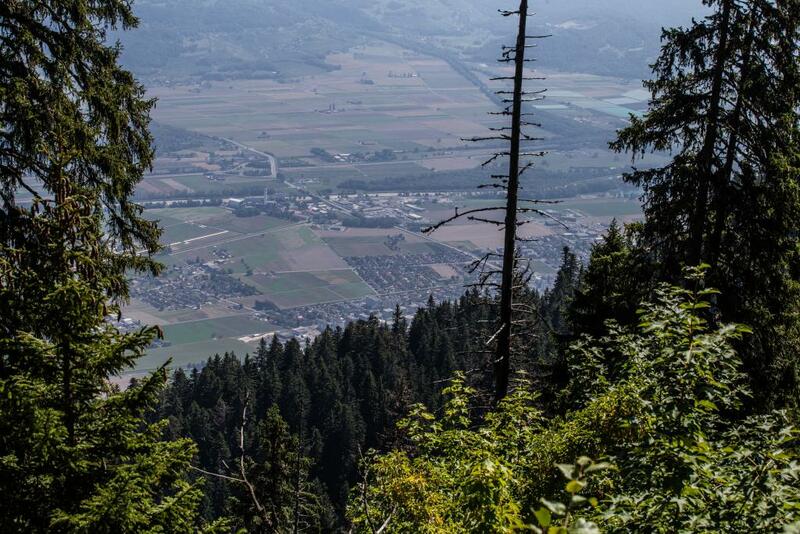 The finish is actually in a town called Aigle, about 3kms from Monthey itself. You're likely going to be starving, there's no cafe on the trail, so you'll head to Migros, just opposite the train stop to get fueled up with snacks for the train ride up the valley. The train station itself is found on the other side of the road to the supermarket, heading up the valley. 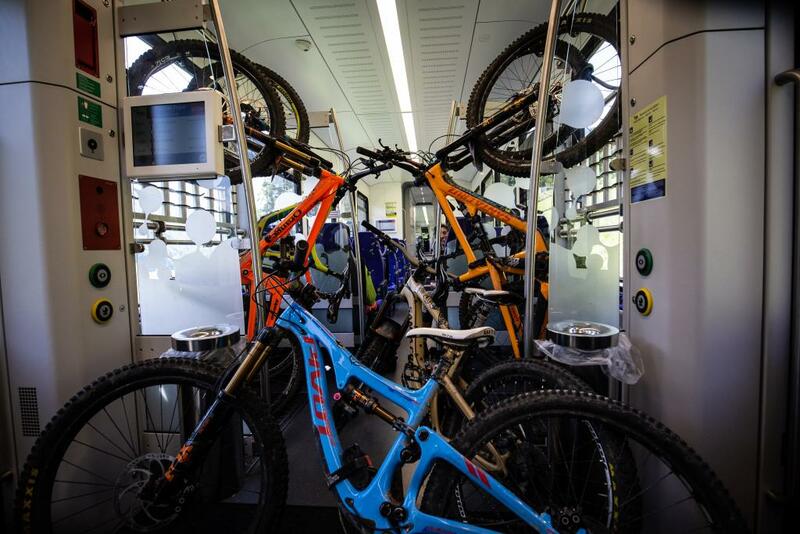 Any day on the bikes where a train is involved? Adventure! You're going to have kept an eye on the train time table all day. Bearing in mind it's 30 minutes from Monthey Sur Place station to Champery, you then have to get up the telecabine and down into Les Crosets to catch the last lift up the Mossettes. From here if there is time you can always catch les Lindarets back to Morzine or cruise through the Goat Village to Lac de Montriond for a well earned swim! Once you are safely on the Mossettes chairlift en route back to France it's time to think about your route home. GR5 down past the lakes and mountain refuges to the top of Pre La Joux or a flat out spring through puncture alley into Les Lindarets? By now you are likely hanging out for a beer so let your instinct be the guide! Don't forget to soak it all up, take those Instagram shots and turn that GoPro on so you can relive it all again back home! 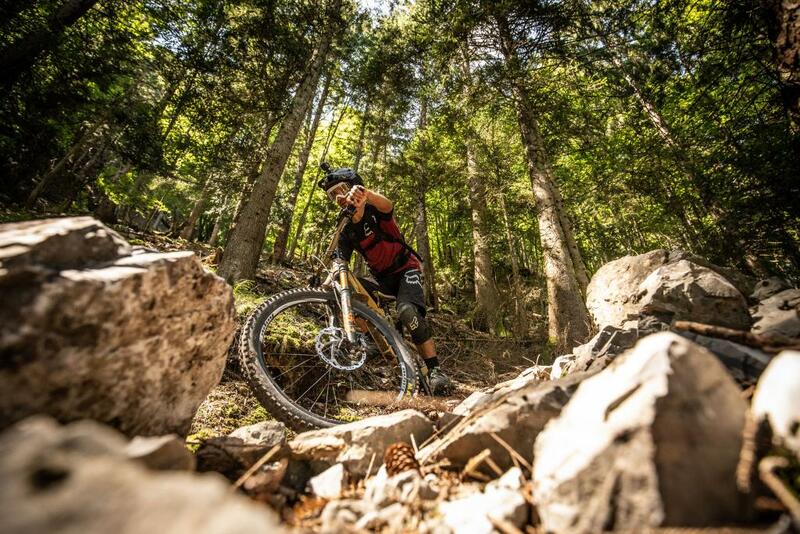 If you want to ride epic adventures like this one, not just from Morzine but all over Europe, check enquire below and check out our ever growing list of locations!